Maybe I'm wrong, but it seems those who didn't live through the seventies have no idea just how big Alice Cooper was. Even some of Alice's own fans are unaware that the name Alice Cooper originally referred to the whole band. The group's PR person convinced them they would be easier to market if the singer shared the name of the band, so mild mannered “son of a preacher man” Vincent Furnier adopted the moniker. The rest is rock and roll history. SUPER DUPER ALICE COOPER begins with a little bit about Vincent's childhood and the near death experience that caused his family to move to Arizona. It was there he met future bandmates Dennis Dunnaway and Glen Buxton, the three of them forming a high school joke band called the Earwigs as a parody of the Beatles. They liked the experience of being on stage so much they decided to learn how to actually play their instruments, and eventually the band (with rhythm guitarist Michael Bruce and drummer Neal Smith) worked their way to the top of the Phoenix, AZ club scene. From there, they moved to California where a befuddled Frank Zappa signed them to their first relatively unsuccessful record deal. Rock super stardom finally found them with the hugely popular LOVE IT TO DEATH album and its hit single “I'm Eighteen”, thanks in no small part to the very hands-on production of Bob Ezrin. 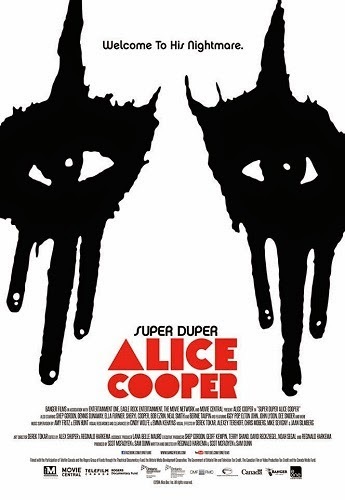 Although Alice tells much of this story himself, SUPER DUPER goes a long way towards reminding people that originally Alice Cooper was a group effort by having band members Dunaway and Smith, as well as producer Ezrin, offer their points of view. One can't help wishing that Michael Bruce had participated (he's apparently on good terms with everyone, having played the occasional reunion show here and there with his old bandmates), and also that more had been said about the group's late lead guitar player Glenn Buxton, who was responsible for co-writing a great many of their hits. It also seems odd how little is said about the BILLION DOLLAR BABIES album, given that it was both the artistic and creative peak for Alice Cooper as a group. But the triumvirate of writer/directors behind SUPER DUPER are ultimately more interested in Alice's personal story than a comprehensive music history lesson. Whether that's a good or bad choice will ultimately depend on the viewer. The crux of the movie, which will hardly be surprising to anyone who has ever seen an episode of VH1's “Behind the Music”, is Vincent/Alice's battles with addiction. A teetotaler for years, in order to get into character as Alice the ordinarily mild mannered Vincent Furnier drank. At first it wasn't so much of a problem, but as the band became more and more successful, Alice had to be “on” all the time. The movie visualizes the struggle using stock footage of John Barrymore's DR. JEKYLL AND MR. HYDE. It's an obvious device, but also an accurate one. Alice's solo years make up the vast majority of his influential and enduring career, but the highlights are far fewer. This is essentially the part of the movie where you gape in wonder and what a mess of a human being he becomes and marvel that he's still alive. If he doesn't quite reach the depths we saw Pentagram vocalist Bobby Liebling hit in LAST DAYS HERE, his ghastly appearance in the early eighties is certainly close. But as Alice's fans know, there is the requisite clean up/comeback which continues to this day. Yes, we've seen this particular rock star redemption story countless times before, and will likely see it again. No doubt some will still find that aspect interesting, but for me a little more focus on the music, or even some of the other aspects of Vincent/Alice's personal life, would have been more interesting. Still, there's enough about the Alice Cooper story that is unique and interesting to appeal to both fans and non-fans who at least have a marginal interest in rock history. The format is a bit too cookie-cutter to warrant a rave, but in the end SUPER DUPER ALICE COOPER at least makes an effort to live up to its adjectives. 3 out of 4 stars. Did the movie explain why Alice Cooper opened the sports/rock themed Cooperstown BBQ restaurant franchise...only to close down Cleveland's branch just a few years later? A bit of this town died with it. Where else could you see a Wall of Fame that matched Vincent Price next to hockey's Bobby Orr?! For no reason I recently watched the 1974 concert film GOOD TO SEE YOU AGAIN...ALICE COOPER. Wow, Alice making a proto-music video with magician James 'The Amazing' Randi, dig it. Bang on review. Pretty much how I saw it as well. Enjoyed it, but thought there would be more details in some era's particularly nothing mentioned about Killer and just a brief mention about BDB.